Our reputable store offers superior vinyl flooring from top name brands. We maintain an excellent reputation by installing high-performance flooring, offering low prices, and providing quality installation services. Locally operated, our company is committed to finding the right type of flooring for you. We provide an exciting shopping experience every step of the way—from selection to vinyl floor installation. When you’re looking to install a vinyl tile floor, trust our experienced installers. We’re committed to providing you with excellent customer service on every job we take on. If you’re interested in purchasing a vinyl floor or you’re in need of a vinyl floor installation, please don’t hesitate to get in touch; we look forward to serving you. If you’re looking for a resilient, cost-effective flooring solution, vinyl is a great choice. 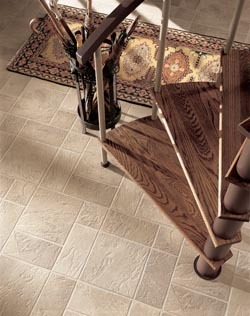 Vinyl tile is a top flooring option because of its durability and attractive appearance. This flooring material is available in a wide range of colors, textures, and patterns, making it the perfect choice for nearly any situation. No matter what your décor style happens to be, you can find a type of vinyl to match it perfectly. These floors are perfect for kitchens, bathrooms, foyers, and many other areas throughout your home. Some vinyl floor options include wax-free, urethane, and enhanced urethane flooring; each of these options presents a different benefit. Enhanced urethane, for example, stands up well to dirt and cleaning solvents. No matter what kind of flooring you’re interested in, our professionals will assist you throughout the selection and installation process, while making helpful recommendations. Our vinyl tile collections include advanced materials that are capable of replicating high-end flooring such as hardwood and natural stone. We base our recommendations on the qualities that are most important to your home, such as pricing, moisture resistance, and durability. If you’re interested in purchasing low-maintenance, stylish flooring, vinyl is a wonderful choice. Once you’ve decided on a vinyl floor, let our skilled installers take care of the installation process. Our installation crew has the knowledge and experience necessary to ensure that your floor is installed properly. We put our experience to work for you and ensure that your investment is protected for looks and longevity. As with all of our services, our vinyl floor installation experts put an emphasis on your particular needs. Whatever your vision for your home’s floors happens to be, we ensure that you realize it. When it comes to hiring a flooring team, it’s important that you work with an established and experienced company. Some homeowners make the mistake of assuming that hiring an amateur to perform a floor installation saves them money in the end. Unfortunately, this isn’t typically the case. The quality of the installation is as important as the quality of the floors you purchase. Don’t take the risk that your floors may not be installed the right way. An improper floor installation could cost you serious money over time, as it may necessitate having another contractor come out to fix the problem. Wouldn’t you rather have the job done right the first time? Once your floor installation is complete, please stay in touch with our professionals for helpful floor-care tips. Taking care of your vinyl floor will prolong its life and keep it looking beautiful and clean over time. When you hire our company to install your vinyl floors, you won’t have to worry about the quality of our work. Our professionals know exactly what needs to be done in order to ensure that your floors look fantastic and last as long as possible. Rely on our products and services to guarantee you get the flooring of your dreams. Contact us if you’re interested in having a vinyl floor installed in your home. We are proud to serve customers located throughout the communities of Sugar Land, Missouri City, Stafford, Fort Bend, and Sienna Plantation, Texas, as well as the surrounding communities.